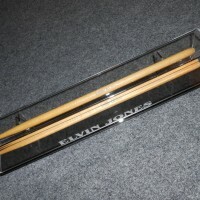 These drumsticks owned and played by Elvin Jones while he was an endorser of the Gretsch Drum Company during the 1970s. 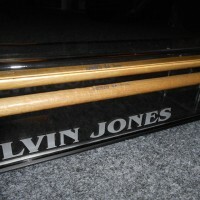 These sticks were acquired directly from Elvin’s wife. Only 15 used pairs of this model are available. 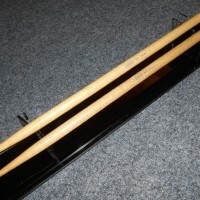 All sticks have legible logos and show considerable wear. Wear marks and printing may differ slightly from the pair in the photos. Includes certificate of authenticity signed by Elvin’s wife. Display case in photos is not included. PRICE, $125.00 pair (flat $8.00 shipping per pair).